Cloaking is a technique wherein different versions of a page are presented to human visitors and search engine crawlers. The content being seen by human visitors which is the actual web page is very different from the content being read by search engine robots crawling the site as it is full of spammy SEP techniques like keyword stuffing. 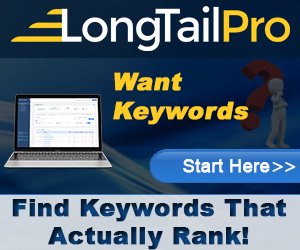 This technique is mostly used by webmasters who would like to fool the search engines in order to gain better rankings. 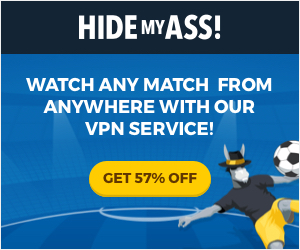 This is considered as an unethical and illegitimate way of optimizing a web page so it is a big no for Google. In today’s post, we compiled several tools to check if a website is cloaking for you to help on your SEO campaign especially if you are going to search for high quality websites which could provide worthy link building opportunities. Here are the 18 Accessible Cloaking Checker Tools that are very useful if you would like to avoid low quality sites when starting to optimize a site through link building. 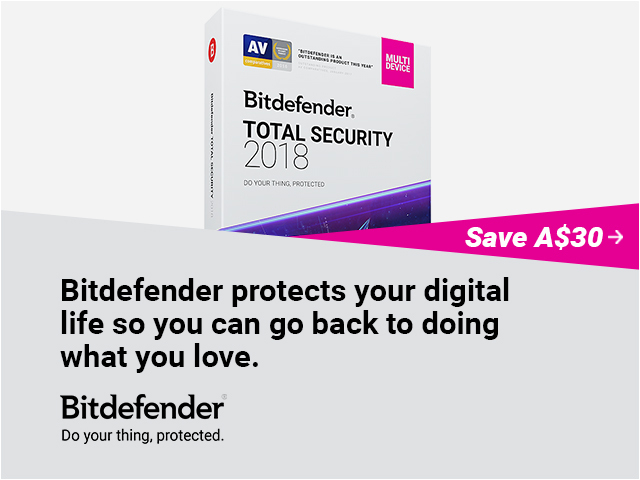 Don’t let your site’s reputation get ruined. 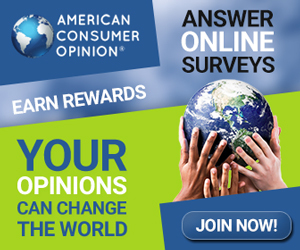 Check out these tools and enjoy! 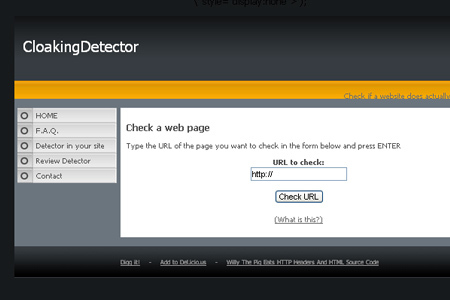 CloakingDetector is a tool which checks whether a website does actually cloaking or not. 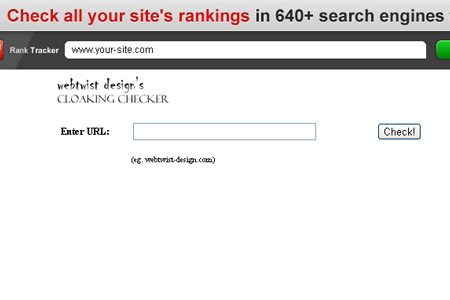 BestSEOTools.net – Website Cloaking is another tool to check if a website is engaging in cloaking. 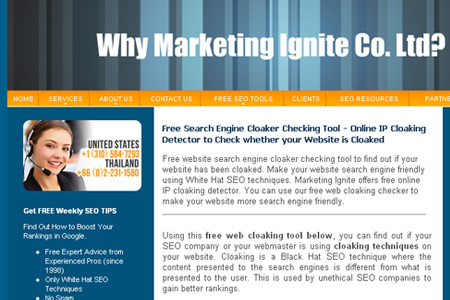 Marketing Ignite offers a Cloaking Checker to find out if your website has been cloaked. 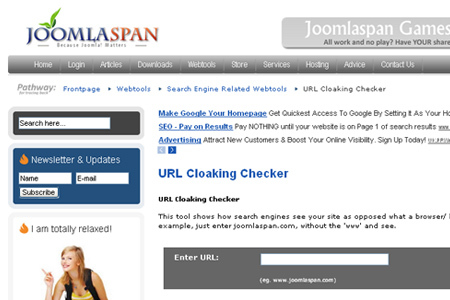 JoomlaSpan – URL Cloaking Checker is a tool which checks a web page and shows how search engines see your site as opposed what a browser/ human would see. 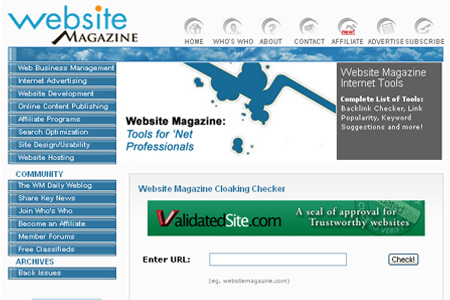 WebsiteMagazine.com – Cloaking Checker allows you to check a website for googlebot cheaters. iWebTool offers a quality tool which allows you to compare how search engine sees a website as opposed to a real web browser. Wallads – Cloaking Checker is another tool for checking cloaking. 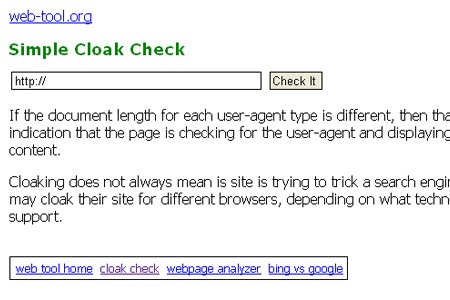 Web-Tool.org – Simple Cloak Check is a tool which checks a web page against different user agents and record the bytes returned for each. 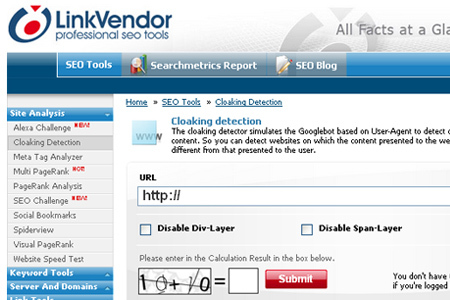 LinkVendor – Cloaking Detector is an easy to use tool which simulates the googlebot to detect cloaked content. WebTwist Design – Cloaking Checker is a tool which shows the typical format of the web page as shown to the browser and that to the Google Bot. 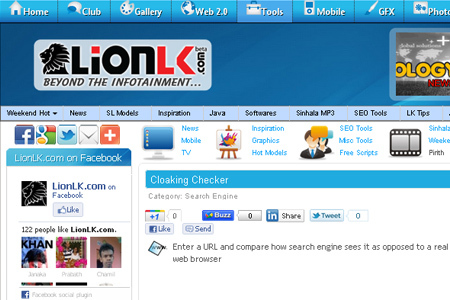 LionLK.com – Cloaking Checker tool lets you compare how search engine sees it as opposed to a real web browser. 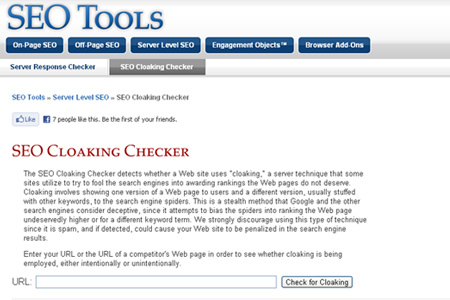 WebToolHub – Cloaking Checker is a free tool you can add to your website to check if a website is cloaking. Optimization.co.uk offers this free tool to test whether your website or your competitor’s site is using this black hat technique. 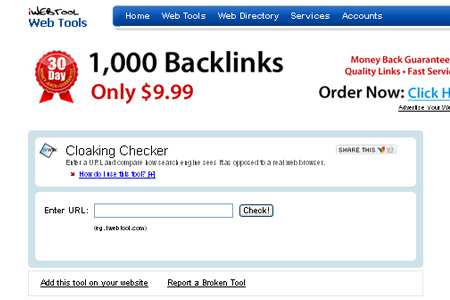 Bali SEO Tools – Cloaking Checker is a simple tool for checking cloaking. 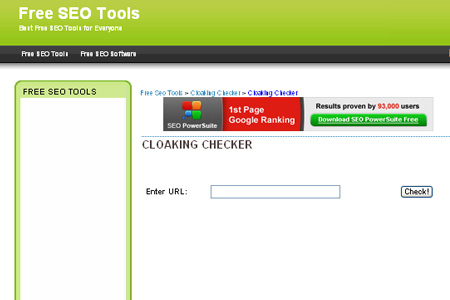 SEO Tools – Cloaking Checker helps you find out if server level cloaking is being used for a site. Pagerank-SEO – Cloaking Checker is a tool which checks if there is any HTML that’s cloaked or hidden from Search Engine bots. 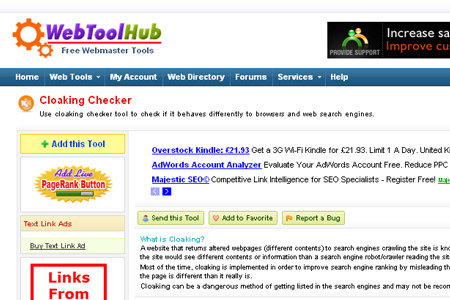 SKT SEO Tools – Cloaking Checker Tool is a tool which checks the content of your website for various search engines. 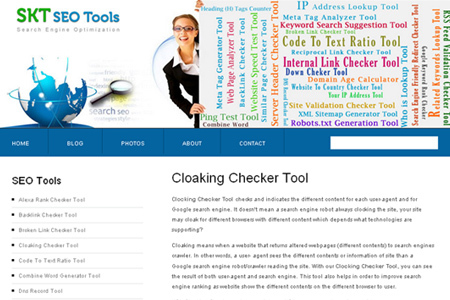 SEOBut has a Cloaking Checker which checks a website to see if it uses cloaking or stealth.